TACLOBAN CITY – The $434 million which the Philippine Government received following the signing of the RP - Millennium Development Corporation compact on September 23, provides funding for three major anti-poverty and anti-corruption projects. The first project is the construction and repair of the 220-kilometer Samar Road with $214.4 million as allocated fund. The road, which passes through 15 municipalities, will improve access to markets and services for farmers, fishers, and small businesses in some of the poorest provinces in the country. This project will hopefully solve the poverty-rooted insurgency problems in the hinterlands. The second project is the Expansion of the Kalahi-CIDSS, a development project that empowers communities by encouraging their participation in poverty alleviation activities. With $120-million allotted fund, the project includes construction of critical infrastructure such as water systems, clinics, and schools. MCC officials said this innovative project design strengthens local accountability and allows poor communities to effectively design and transparently manage the projects they need to increase their incomes and improve their lives. The third project is the $54.3 million in investments to computerize and streamline business processes in the Bureau of Internal Revenue (BIR), which is seen to bolster the effectiveness of revenue collection and reduce opportunities for corruption. 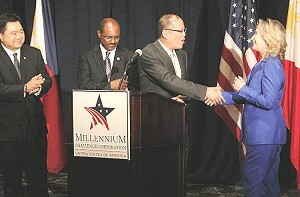 The signing of the RP-Millennium Development Corporation (MDC) compact presided over by President Benigno S. Aquino III and United States Department of State Secretary Hillary Clinton, who expressed total support and confidence in the present administration. The agreement was signed by Finance Secretary Cesar Purisima and Millennium Challenge Corporation (MCC) chief executive officer Daniel Yohannes at the Waldorf Astoria Hotel in New York, USA. MACROHON, Southern Leyte – A structure that would serve as a 24/7 guard house watching the fish sanctuary that straddles two barangasy here, Sta. Cruz and Molopolo, was successfully turned over on Friday from a German government donor, GTZ, to the local government leaders and to the fisherfolks in the area. Key officials of GTZ in the province, Mary Ann Tercero and Vince Delector, Jr., handed the symbolic key to Macrohon Mayor Fe Edillo, Vice-Mayor Allan Aroy, and the barangay leaders in the area, Allan Montilla and Ike Montilla, of barangays Sta. Cruz and Molopolo, respectively. It was the last turn-over rites for the seven GTZ-funded watch towers in Southern Leyte, said Delector, GTZ Sr. Coordinator for the Environment Research and Development (EnRD) program. In a brief chat with PIA shortly before the program started, Delector revealed that the location of the seven watch towers were in the marine fish sanctuaries of Silago, Hiunangan, Hinundayan, Limasawa, Pintuyan, Maasin City, and Macrohon. The construction of the watch towers, which cost P1 Million each with counterpart funds of at least P100,000 from the recipient LGUs, began in 2008, but it was only in July this year when the scheduled turn-overs started, Delector added. Maasin City’s watch tower was situated at Hapitan beach in barangay Manhilo, and it was just handed over on Thursday, September 23, the second to the last that was turned over, it was learned. Provincial Board Member Albert Esclamado represented Gov. Damian Mercado in the ceremonies for the Macrohon turn-over. In his inspirational message, Board Member Esclamado cited the activity as a landmark event, even as he reminisced the efforts of all those involved in initiating the project, and called on those concerned to sustain efficiency of the four-storey, concrete guard post for the future generations to use and appreciate its value, especially in protecting and preserving the fish sanctuary. Mary Ann Tercero, GTZ Advisor, stressed that the watch tower can also serve as a learning center for children and as a venue for important gathering and meetings of various sectors, among them women. For her part, Mayor Edillo said she accepted the challenge of maintaining the structure, saying this will form part of her legacy. TACLOBAN CITY – The national president of the Local Legislators League of the Philippines on Population, Health and Environment and Development (3LPHED) appealed before the local chief executives and local legislators in Eastern Samar gathered here on Thursday for a two-day congress, for support and cooperation in the attainment of population, health, environment and development initiatives in line with the Millennium Development Goals (MDG). The theme of the 3rd 3LPHED congress is anchored on “The Legislators as Partners in the Attainment of MDG Goals”. Atty. Sabulao stressed that the congress is aimed at informing all the new elected local chief executives and local legislators in Eastern Samar regarding the initiatives and taking of concrete steps and measures for the realization of these initiatives in their localities. Sabulao likewise encouraged local legislators to pass resolutions and ordinances in support to these initiatives. He mentioned some local laws passed already by local legislators in the province like the Eastern Samar Comprehensive Health Code and some local laws already approved like the Child and Youth Welfare Code and the Gender and Development Code. “I hope that we are one and in the same direction in attaining these initiatives in Eastern Samar”, Sabulao said. TACLOBAN CITY – Leyte Governor Carlos Jericho L. Petilla was elected unopposed as the chairman of the Eastern Visayas Regional Peace and Order Council during the reorganization meeting conducted at the DepEd Conference Room on September 24. Governor Petilla who was recently endorsed as the chairman of the Regional Development of Eastern Visayas, said that his vision is to make the RPOC in Eastern Visayas, not just an ordinary council for compliance, but one that matters. The meeting which was presided by DILG Director Francisco C. Jose, also saw the election of Northern Samar Governor Paul Daza as the vice-chairman of the RPOC in Region 8. It was observed that only the two governors were present during the meeting but the other four were properly represented. Since only one City in the Region was represented, the City of Maasin will seat at the representative of the Cities in Region 8. The body also nominated six Private Sector Representatives. From among the six, the RPOC chair will appoint three PSRs after security check. The body unanimously approved the motion to endorse Governor Petilla and Governor Daza as the chair and vice-chair of RPOC 8 for appointment of DILG Secretary Robredo with the approval of President Aquino. Executive Order No. 773 issued on January 5, 2009, called for further reorganization of the Peace and Order Council. An unnumbered Memorandum dated August 11, 2010 of Secretary of Interior and Local Government Jesse M. Robredo enunciated this. The Regional Peace and Order Council (RPOC) shall be composed of the region's Provincial Governors, the Mayors of the Highly Urbanized Cities, the Presidents of the Leagues of Municipalities, the regional counterparts of the departments, offices and agencies enumerated in NPOC, wherever applicable, with the Chairman and Vice-Chairman to be appointed by the DILG with the approval of the President of the Philippines from among the members of the Council. In addition, there shall be one representative of the Mayors of the Component Cities to be chosen from among themselves. The Chairman of the RPOC shall appoint the three (3) representatives of the private sector, upon consultation with the members of the Council and upon acquiring the appropriate security clearances. The regional counterpart of the CSAFP shall be the Commander of the Infantry Division. Departments, offices and agencies with no regional and/or field offices shall not sit in the RPOC. The duties and functions of the RPOCs include, among others, to provide a forum for dialogue and deliberation of major issues and problems affecting peace and order, including insurgency; to recommend measures which will improve or enhance peace and order and public safety in their respective areas of responsibility, including anti-insurgency measures; and to recommend measures to converge and orchestrate internal security operations efforts of civil authorities and agencies, military and police. The other duties and functions include, to apply moral suasion to and/or recommend sanctions against local chief executives who are giving material and political support to the Communist rebels; to monitor the provision of livelihood and infrastructure development programs and projects in the remote rural and indigenous population areas adopted to isolate them from the Communist rebels' "Agitate/Arouse, Organize and Mobilize" and ideological, political and organization works; and to perform all other functions assigned by law, the President or the NPOC. TACLOBAN CITY – The Department of Health (DOH) in Eastern Visayas will allocate a considerable amount next year to finance the various health programs and projects of the department in the region. Dr. Edgardo M. Gonzaga, Regional Director of DOH 8 informed that his agency will allocate P671-M to finance infrastructure projects, equipment and capital outlays to Rural Health Units (RHUs), government hospitals and even the improvement of Barangay Health Centers. The health chief made this pronouncement before the local chief executives and local legislators of Eastern Samar who attended the two-day 3rd 3LPHED Congress held here Thursday at the Balyuan Convention Center. Dr. Gonzaga stressed that there is a need to provide enough financial support to LGUs so they can successfully implement health related projects and programs in their locality. “I recognize the difficulty of LGUs in implementing programs and projects because of the very limited Internal Revenue Allotment (IRA) they received from the national government”, Director Gonzaga said. He added that LGUs cannot really implement projects and programs and improve the delivery of basic services in which one of those is health services beneficial to its constituents, because of the lack of funds. He revealed that DOH 8 will focus next year in the improvement of Rural Health Units (RHUs) including the putting up of health station in island barangays in the region. The health chief in region 8 is also contemplating of putting one health worker, a midwife in particular in every barangay in Eastern Visayas, as his positive response to the call of President Benigno S. Aquino to further improve the delivery of health services to Filipinos. This move is likewise in consonance to the attainment of the Millennium Development Goals (MDG) particularly in item numbers 4 and 5 which are the reduction of child mortality and maternal mortality in 2015 in the country. TACLOBAN CITY – Confiscated, donated and abandoned wild plants and animals can now have temporary and appropriate refuge center while they are quarantined or properly cared for as the Regional Wildlife Rescue Center (RWRC) starts its operation on a 10 hectare area located in Barangay Salvacion, Tacloban City. (Left Row) Mayor Romualdez, RTD Danilo Javier and CENR Officer Marciano Talavera, (Right Row) RED Galinato and City ENRO Jonathan Hijada during the signing of the MOA for the establishment of the Regional Wildlife Rescue Center. The establishment of a RWRC developed as the Department of Environment and Natural Resources (DENR), Region 8, through the leadership of Regional Executive Director Primitivo C. Galinato Jr, signed a Memorandum of Agreement with the City government of Tacloban headed by Mayor Alfred Romualdez and the Paraclete Integrated Agro-Forest Development Association, Inc. (PIAFDAI) led by its President Joel Regato. The simple ceremony was held at the Mayor Alfred Social Action (MASA) Office, this city on September 22, 2010. In the said MOA, the DENR and the City of Tacloban shall co-manage the operation as well as the maintenance and protection of the RWRC. The PIAFDI shall also help in maintenance and protection of the forest covering their Community Based Forest Management Area where the RWRC is co-located. During the MOA signing DENR’S Protected Areas Wildlife and Coastal Zone Management Service Regional Technical Director Danilo A. Javier said that the 10 hectare area intended for the RWRC shall be delineated by the DENR’s Land Evaluation Party as it is located within the CBFM Project awarded to the PIAFDAI per CBFM Agreement granted on December 18, 1999. Red Galinato assured the compliance of the DENR in the provision of P300,000 for the establishment of the RWRC including expenses for food, medical supplies as well as the marking and tagging materials for animals that will be in custody by the center. In addition, the DENR shall provide P100,000 annually for a period of three years. It shall also provide assistance to the Tacloban City LGU in the conduct of manpower capability building on wildlife rescue and handling. On the other hand, Mayor Romualdez committed to abide by the terms stated in the MOA such as providing counterpart funding of P100,000 for the establishment of the RWRC. The city government shall assist the DENR in the conduct of resource assessment, develop, design and construct facilities for the center clinic, laboratory, quarantine and office facilities. The City Veterinary Office shall provide veterinary services to all animals in custody of the RWRC. Also, it will provide funds for the rehabilitation of denuded and degraded areas within the perimeter of the center. Its City Environment and Natural Resources Office headed by Mr. Jonathan Hijada shall take charge in the management, maintenance and operation of the RWRC. Witnesses to the MOA signing are: CENR Officer Marciano Talavera of DENR-CENRO Palo, Leyte, City Environment and Natural Resources Officer Jonathan Hijada, Protected Areas and Wildlife Division Chief Corazon Makabenta and other staff from the DENR and the City of Tacloban. 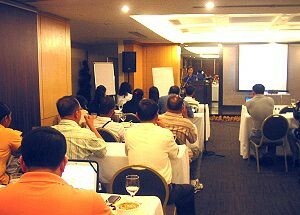 CATBALOGAN, Samar – The three organized Muti-Sectoral Quick Reaction Teams (MSQRTs) coming from Luzon and the Visayas converged at the Madison Plaza, Astoria Plaza Hotel, Ortigas Center, Pasig City in Manila for a two-day training workshop on Quick Reaction Mechanisms last September 19-20. The activity, which was jointly initiated by the Ateneo Human Rights Center (AHRC) and EU-Philippines Justice Support Programme (EPJUST), was relative to the establishment of MSQRTs in the countryside where cases of Extra-Legal Killings (ELKs) and Enforced Disappearances (EDs) are apparently high or alarming. The Multi-Sectoral Quick Reaction Team (MSQRT) is a one stop shop service group, composed of both the government and private agencies, that is committed to give a quick response or immediate assistance to ELK and ED victims. Member institutions are identified to come from the church, non-government organizations, civil society, academe, security forces and government agencies. Under its structure, the primacy of partnership is recognized. Thus, the respective mandates of every institution are respected. Services extended by the MSQRT are mainly victim-oriented rather than perpetrator-oriented, the AHRC explains. The three formally organized MSQRTs are the “KAUGOP” (MSQRT Leyte); the “ANDUROG KAN DERECHOS” (MSQRT Albay); and “DARANGPAN” (MSQRT Catarman, Northern Samar). Western Samar stakeholders have already signified its commitment to organize its own MSQRT and are now formalizing its protocol for a scheduled launch on October, this year. Samar MSQRT’s presence in the said training, as an observer, was represented by Samar News.com who is an active partner of the said organization. Likewise, collaborative meetings among stakeholders in Negros Occidental and Surigao del Sur are ongoing and being monitored by the AHRC. “Kaugop” was launched last April 29, 2010 while the “Darangpan” was simultaneously launched on October 19, 2010 when the “Year of Peace and Justice” was also declared in Northern Samar. The “Andurog Kan Derechos” was formally established on October 2009 and is recognized as a pioneering MSQRT in the Philippines. In fact, it is being credited for finalizing the first protocol that served as a pattern for the succeeding protocols drafted by newly organized MSQRTs. The session was started by a welcome message and an Overview of the Concept of the MSQRT Project which was delivered by the AHRC Executive Director, Atty. 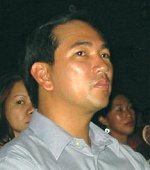 Carlos P. Medina Jr., a newly appointed member of the Truth Commission. On its second day, Training on Psychosocial Assistance was facilitated by Ms. Romina Sta Clara, National Human Rights Key Expert of the EU-Philippines Justice Support Program (EPJUST); Sanctuary, as a related service, was discussed by Mr. Max M. de Mesa, Philippine Alliance of Human Rights Advocates; Training and Documentation and Reporting of Cases of ELKs and EDs was comprehensively lectured by Ms. Sunshine Serrano, Program Officer of the Task Force Detainees of the Philippines (TFDP) and lastly, a brief training on Investigation came from Atty. Robert Alcantara of the Commission on Human Rights. A synthesis and planning culminated the training workshop with Atty Khrisna Gomez, Atty. Patricia Cervantes and Ms. Anna Canilo as training coordinators and facilitators. The sharing of experiences, issues, concerns and challenges during the sessions resulted to a consensus and commitment by every stakeholder to improve the existing operational mechanisms of the MSQRTs in the different localities. A more efficient and systematic approach in addressing the needs of victims of ELKs and EDs were conceptualized as a result of these deliberations. However, while the support institutions continually conduct capacity building efforts on various fields of the MSQRT services, a test case has yet to be experienced to determine the MSQRT capability in accomplishing its mission of promoting justice and peace in the society through a multi-sectoral approach. Finally, a Regional MSQRT gathering has been set in Catbalogan on October 12, 2010. Both the KAUGOP and DARANGPAN core group will be around to assist in the formal organization of the MSQRT-Samar. TACLOBAN CITY – Comelec Region 8 Director Nick Mendros informed that the Comelec gun ban in connection with the Barangay and SK elections started at 12 midnight of September 25. Meanwhile, Police Region 8 PSSupt Edgar O. Basbas who represented Director Revilla in the Regional Peace and Order Council meeting on September 24 informed that the Philippine National Police is ready to implement gun ban in Region 8. The Commission on Elections (COMELEC) earlier issued guidelines covering the bearing, carrying and transporting of firearms and on the employment of bodyguards as part of security preparations for the October 25, 2010 Barangay and Sangguniang Kabataan (SK) elections. Through Resolution No. 9028, the COMELEC en banc reiterated the need to strictly enforce Sections 32 and 33 of Republic Act No. 7166, that states "during the election period, no person shall bear, carry or transport firearms or other deadly weapons in public places, including any building, street, park, private vehicle or public conveyance, even if licensed to possess or carry the same, unless authorized in writing by the Commission. The issuance of firearms shall be suspended during the election period." The Comelec has set the election period from September 25 to November 10, 2010 or 30 days before the date of the election and 15 days thereafter. This is the period when gun ban is effected. The same provides that only regular members of the Philippine National Police (PNP), the Armed Forces of the Philippines (AFP) and other law enforcement agencies of the Government are authorized to carry and possess firearms during the election period, provided they are in their full uniforms and are in the actual performance of their election duties. Meanwhile, Section 33 of RA 7166 states that "during the election period, no candidate for public office, including incumbent public officers seeking reelection to any public office, shall employ, avail himself of or engage the services of security personnel or bodyguards," unless otherwise "assigned by the Commission upon application." Candidates for the Barangay and SK positions, any public officer or private individual, however, may avail of the services of security personnel or bodyguards, provided that they file the proper application before the Commission. The application must be accompanied with a "threat assessment issued by the AFP or PNP." A filing fee of P1,000.00 shall be charged for each application.